George Graham Reviews Tyler Reese's "Reminiscence"
Back in the 1970s and 80s, a number of guitarists who got to be top session players put out their own albums, and usually they were jazz rock fusion. Examples include Larry Carlton, Lee Ritenour and Robben Ford, whose early solo projects was a precursor to the Yellowjackets. Such studio players gravitated toward fusion, since it gave them a chance to show off their guitaristic abilities and their jazz backgrounds, and also to aim for wider audiences than a straight-ahead jazz recording would achieve. That trend tapered off after a while, but this week, we have a new recording which is a like a classic jazz-rock fusion album by a studio guitarist, in this case, one based in Nashville. It’s Tyler Reese, and his new recording is called Reminiscence. Twenty-three year-old Virginia native Tyler Reese was something of a prodigy and already has a lengthy resumé. He started studying classical piano at age three, then took up jazz guitar at 12, and made his first album at age 15. A few years ago, he made some duo recordings with Elisa Fiorello-Dease, who sang backup for Prince. That recording came to the attention of Prince who invited Reese to Minneapolis where Prince essentially got some pointers on technique from Reese. Reese also connected with guitarist Pat Metheny, who provided Reese with a master class. Reese also attended the Berklee College of Music for a while, though he left to pursue his professional career. Reese found a home in Nashville, where he has worked as a session musician and he also frequently tours touring as a sideman, including performing in the Middle East to entertain US troops. Reminiscence is Reese’s third album, and after years of doing studio work in Nashville, he wanted to get back to his jazzy roots. The result is a pleasing album of jazz-rock fusion with the gloss that comes from the studio work. He collaborates with a number of similarly experienced musicians, performing Reese’s compositions which incorporate the range of facets of the fusion style, from rhythmically complex to funky tunes to one that borders on New Age. It’s well-done with good playing all around, though it’s not without its little quirks, and a few cliches that will be familiar to long-time fusion fans. Along the regulars on the album are Paul Rucker on keyboards, who interestingly plays mostly acoustic piano, Tony Fairchild on drums, and three different bass players depending on the track, Gary Grainger, Mark Fain, who plays some acoustic bass, and Carl White, the main electric bassist on the album. There are some horns and strings who appear on a couple of tracks. Reese’s guitar work is probably the most impressive thing on the album, but he does not hog the musical spotlight. 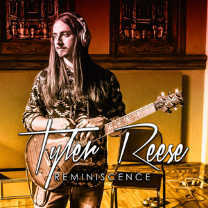 Tyler Reese’s new album, Reminiscence is a generally enjoyable recording in the great tradition of a studio guitarist putting out a jazz-rock fusion record. The playing is first-rate, Reese’s composition are very good, though the production and sound do leave something to be desired. Reese and his fellow studio musicians did what studio musicians usually do, especially in places like Nashville, and that is to play to a click track, so on the slower tunes, the rhythms are unvarying and stiff, and sometimes a little too fast for best results. But taking things fast we can attribute to Reese’s youth. Sonically, though the album is a big disappointment. We’ll give is about a grade C. It was mixed and mastered with typical brain-dead allegiance to the loudness wars, with the music not only badly over-compressed for artificial loudness, thus stripping out a lot of detail and the dynamics of the performance, but there are also numerous instances of outright distortion from overloading. The horns on the track 2Funk, for example, sound awful, like sonic sandpaper. There’s no excuse for this kind of thing in an era where very good sound can be achieved easily. Once common, guitar-oriented fusion albums like this are more of a rare treat for fans of the genre. If you don’t mind putting up with the crummy sound, Tyler Reese’s album is a worthwhile addition to a long-running tradition, of versatile guitarists showing their stuff.